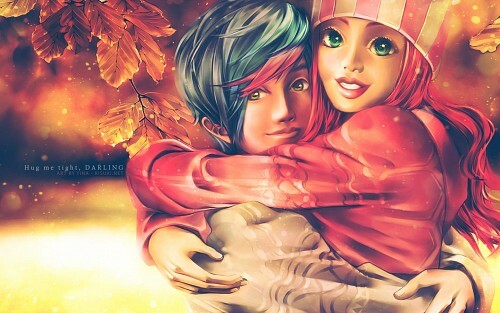 Original Wallpaper: Hug me tight, darling! Minitokyo »	Original Wallpapers » Original Wallpaper: Hug me tight, darling! WOW... I haven't submitted a wall for such a loooooooooooooooooong time! Well I kinda switched to drawings only and they're usually vertical, thus no wallpaper dimensions. Looks really good the girl looks a bit less than the guy imo but no matter...you did an amazing job! I love it. I think the girl looks odd because you are trying to make her look more anime-style with the big eyes. I think she would be perfectly fine being made similair to the guy, a bit more realistic. I am pretty sure she would be less intimidating!